Which details is more important? The Hermes scarf as a belt, leather jacket or the sheer blouse? Cool way of combining details and materials! Love the sheer blouse and the scarf! Always love a sheer black blouse. And the scarf as a belt is gorgeous! i love sheer tops. So cute! I love the light on the photo and of course, the details! A blond Gipsy girl, it works. Black on a bright blonde…the best!!! 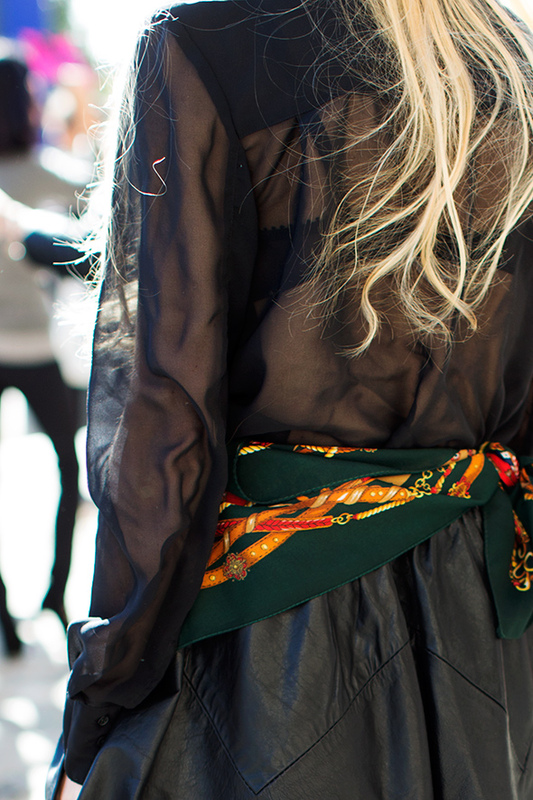 Such an unexpected combination and use of the foulard… Great mix of textures too! The hair, the sheer blouse, the leather… Overall, great picture!! This is kind of gipsy style. Don’t see this very often. Interesting, and also the long hair plays in nicely. Nice photo, love the sheer shirt with the leather skirt! Belting with a scarf is so fun!! love the golden wisps of curly tendrils bouncing off the blouse!! Have *never* liked Hermes scarves. But deconstructed, as in this pic, and with all the other details… Yes, this is quite a look! Nice photo!Love the black sheer blouse and the scarf!! so great with the Hermes scarf!! Beautiful photo! Details on scarf are amazing. i wonder how it would look if she wore a neon blouse underneath. Well, some people can, and some people can’t. Without envy I want to stat, that she surely can pull it off, while on me it would look ridiculous or granny-style (the scarf!). So, chapeau! Wow! great combination of leather skirt, see-through blouse and a scarf as a belt! Love it! love this foulard! so chic and parisian! Love how you show every detail of differents outfits! Love this! Gorges. Very chic. Great capture! Really so nice pics. Like always. Have a nice day. Amazing shot! That’s what I call an interesting shot, we can’t see her face, shoes and the outfit but we can imagine how beautiful and stylish she is!!! I’m wondering if this person is wearing a leather skirt or is it a jacket tied aroung the waist, but if it were, the scarf wouldn’t lay this flat. Intriguing, feminine, creative and beautiful with this shock of blond hair on black sheer . There is so much leather paired with softer materials right now and all I can say is give me more. Gorgeous scarf, love the hunter green with the black. The hair or the scarf?